It appears that Opera North is able to turn any adverse situation to its own advantage. Because the orchestra pit at the Grand Theatre is not able to fit a large orchestral ensemble, during the last part of the season the musicians focus on only one work – and that, one of the most demanding in terms of the number of performers required – and tour England with it, starting at the impressive auditorium in Leeds City Hall. 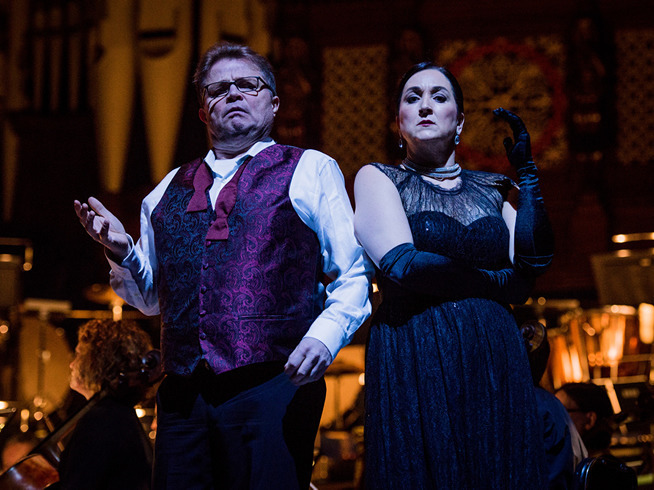 In order to satisfy an audience thirsty for theatre, they present the work in a semi-staged version, without expensive props and costumes, discreetly stage-directing the singers gathered in the foreground in front of the orchestra. This requires considerably more precision and imagination than a traditional opera staging, but it yields superb effects, as is attested by the successes of Der Ring des Nibelungen from two years ago and last year’s Turandot. It sometimes happens that Opera North puts its money on the wrong horse and wins despite that: I have in mind its last music director, who in April 2017 broke his contract in quite mysterious circumstances, thereby giving Turandot and the crowning work of the current season, Salome, into the hands of another conductor. But we shall speak about that in a moment. As I write these words, Richard Strauss’ scandalous drama is still on tour with the Opera North ensemble. I managed to catch Salome at the Warwick Arts Centre on the University of Warwick campus. The university, located in suburban Coventry, numbers among the seven ‘plate glass universities’ erected at the beginning of the 1960s on the initiative of the University Grants Committee. The name ‘plate glass universities’ attached itself to them on account of their modernist architecture, sharply contrasting with the appearance of Oxford’s and Cambridge’s medieval buildings and with that of later brick layouts from Industrial Revolution times. The University of Warwick occupies a surface area of nearly three square kilometers, and is a self-sufficient campus with splendidly-functioning infrastructure. Anyone who gets bored of studying in the 24-hour library or lying out on the grass among the tamed wild geese can take advantage of the abundant offerings of the Arts Centre, the largest British ‘cultural combine’ after London’s Barbican. The building is also home to the freshly-renovated Butterworth Hall – with its intriguing pseudo-industrial decoration, superb acoustics and functionally-designed auditorium with over 1500 seats. Jennifer Holloway (Salome) and Oliver Johnston (Narraboth). Photo: Robert Workman. Even so, the orchestra – though still slimmed down by about a dozen instruments included by Strauss in this mammoth score – took up nearly the entire stage. In comparison with previous Opera North ‘semi-stagings’, the concept for Salome turned out to be even more economical (stage director: PJ Harris; lighting: Jamie Hudson). It was missing not only Jokanaan’s head, but also the dance of the seven veils. There was also a lack of clear interaction between the characters. Which is all well and good – because in this work, there is no such interaction. No one here converses or sympathizes with anyone. The only human figure in this bloody story – populated by degenerates ruled by animal instinct and by repulsive fanatics – seems to be the young, lovesick Narraboth. The stage director made the wise decision to leave these monsters to themselves and lay bare their emotions. Each one had to build their character from scratch: with singing, gesture and body language. In this Salome, there is no dirt, jewels or blood – but for all that, there is pure hatred, lust and desire for vengeance. And enough ambiguities to provoke the viewer to independently put the narrative together into a single whole. PJ Harris’ concept would have misfired, were it not for the commitment of the soloists, who in most cases gave properly-finished creations. I did not expect to hear a world-class Salome at Butterworth Hall. The American Jennifer Holloway began her career as a mezzo-soprano, gradually involving herself in more and more difficult roles scored for dramatic soprano. Today, she has a voice that is ideally balanced, with a splendidly open top register and sonorous low notes (including the famous contralto G-flat in the final monologue), but above all, dark and sensuous, thanks to which she was able to create a princess close to Strauss’ ideal. This was no spoiled girl, but rather a passionate woman panting with sexual desire – to this day, my ears resound with the phrase ‘Ich habe deinen Mund geküsst, Jochanaan’, with the last syllable of the prophet’s name accented so lecherously that even I flinched with revulsion. Beyond this, Holloway is a wonderful actress and a beautiful, strong woman in ironclad vocal condition. Jokanaan in the person of Robert Hayward literally quaked at the sight of her, though I must admit that with his phenomenal acting, he was making up a bit for the deficiencies of his now slightly worn bass-baritone. 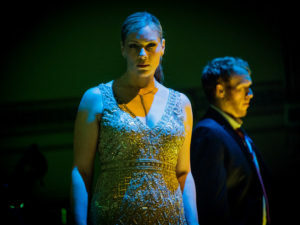 Mezzo-soprano Katarina Karnéus likewise paled in comparison with Salome, though even so, her vengeful Herodias attained far-above-average heights. Arnold Bezuyen, a superb character tenor gifted with an unerring feel for the Strauss idiom, turned out to be a perfect Herodes. Basically, there were no weak points in this cast: separate words of praise, however, are due to Oliver Johnston (Narraboth), who sang out his unrequited love with one of the purest and most golden-toned lyric tenors I have heard in recent times. Arnold Bezuyen (Herodes) and Katarina Karnéus (Herodias). Photo: Robert Workman. The collective hero of the evening turned out to be the orchestra under the baton of Sir Richard Armstrong – playing with a beautiful, shimmering sound, in unity without smothering the individuality of the musicians, aptly bringing out the kaleidoscopic variety of this score. Much of the credit for this goes to the experienced conductor, a distinguished connoisseur of the scores of Verdi, Strauss, Janáček and Wagner who served as assistant to, among others, Solti, Kubelik and Klemperer during the golden years of the ROH. Armstrong also led last year’s Turandot, having substituted at the last minute for the Opera North music director, who had left his post a few months after being hired. But after the première of Der Rosenkavalier, with which he opened his first season, the critics predicted a superb career for him in the Strauss repertoire and awaited him impatiently on the podium in Salome. Is it the curse of the Fitelberg Competition, whose winners cannot later make a name for themselves on the music market? For the name of the conductor who disappeared was Aleksandar Marković, who took 1st place ex aequo with the Lithuanian Modestas Pitrėnas in Katowice in 2003. But let us not jump to conclusions; maybe he will hit the big time yet. The example of Sir Richard Armstrong appears to indicate, however, that real opera conductors should not be sought among competition winners, but rather among people whom opera once ‘hit right between the eyeballs’. I cite Armstrong’s own words with which, in an interview, he once summed up his first encounter with the queen of musical forms.